As the temperatures rise, the snow melts — they’re all signs of a welcome change coming our way! We’re getting ready for spring and we want you to be prepared, too. With that in mind, we put together a list of products to usher in the new season. Here are this week’s Items We Adore: Product Picks for the Season Change. You’ll be effortlessly stylish wearing this Women’s Jersey Knit Maxi Dress. The flowing dress features a flattering empire waist and wide shoulder straps. It has a V-neck in both the front and the back. It’s super soft, comfortable and easy to wear. Length is 55″ from the top of the shoulder. Rayon and spandex. Machine wash. Imported. Ideal for tailgating, hiking, picnics, the beach and more, the Oversized Insulated Cooler Backpack makes the perfect accessory. 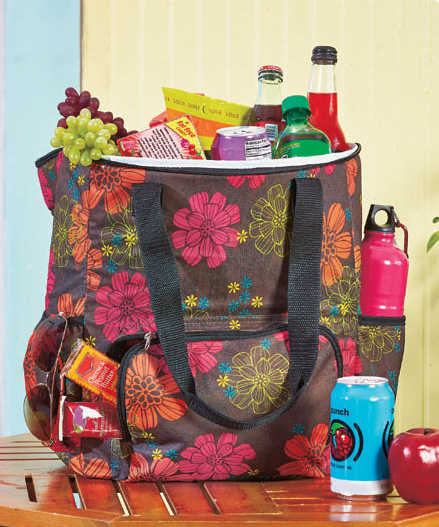 Fully insulated interior can hold up to 24 beverage cans, snacks or whatever else you need to stay cool. Two cinched side pockets and a zip pocket on the front add space for other items. Adjustable straps provide a comfortable fit, or carry it by the handles. 17″ x 12-1/2″ x 6″. Straps adjust from 5-1/2″ to 13-1/2″. Polyester and metal. Imported. Prepare for an epic water balloon fight in minutes with this 2-pack Bunch O Balloons water balloons. Each pack contains 3 hose attachments, each with 35 pre-connected balloons for a total of 210. 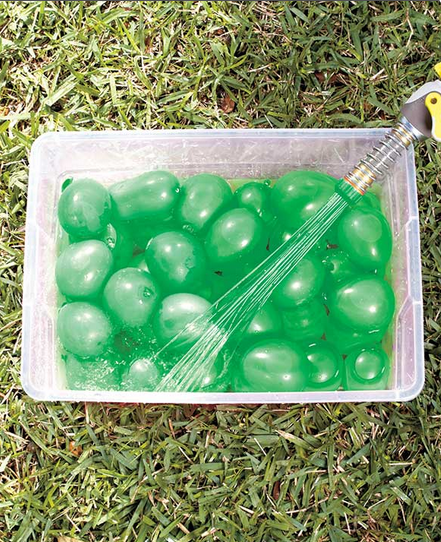 Add one attachment at a time to your garden hose, turn on the water, and the balloons will fill in seconds. When they’re filled, give the hose a gentle shake and that will tie up the balloons and disconnect them from the attachment. Be sure to do this over a container large enough to catch all the balloons as they drop off. Colors include pink, purple, orange, white, green and blue. Polypropylene and rubber. For ages 3 and up. 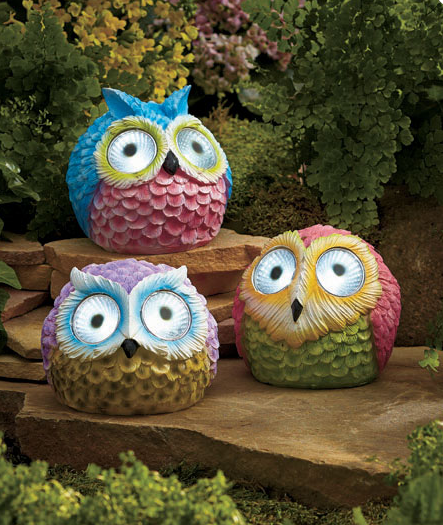 The adorable design of the Solar Spotlight Garden Owl brightens up your outdoors, no matter what the time of day. Decorated in lively spring colors, it complements your garden’s blossoms. Its eyes are twin spotlights powered by the sun. On/off button. Approx. 4-1/4″W x 4-1/2″D x 3-7/8″H. Cold cast ceramic. 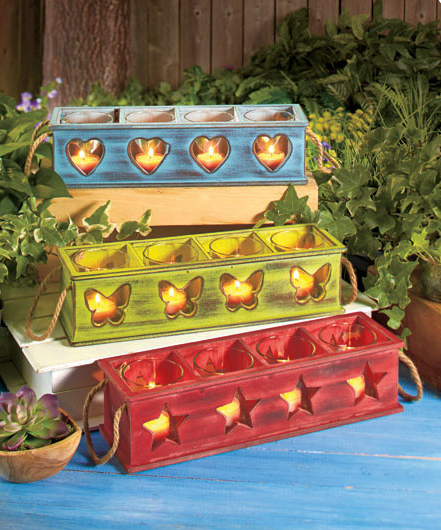 Wooden Tea Light Candle Box lights up a table or shelf with country sensibility. Each of the 4 glass tea light cups has its own compartment in the box. Light from the flame shines through the themed cutout. Decorative rope handles and a distressed finish add an extra rustic touch. Box, 13-7/8″ x 4″ x 3-1/2″. Candle cups, 3-1/8″ x 2-3/4″ dia., each.